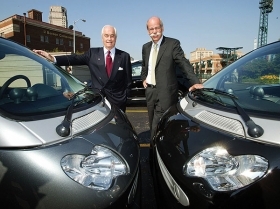 Roger Penske, left, surprised Dieter Zetsche, right, with the number of Smart ForTwos that were sold in the U.S.
DETROIT — Was it Roger Penske's golden touch that sold so many Smart microcars in the United States last year, or the right product at a time when consumers crave fuel economy? It was probably a bit of both. But even Daimler AG CEO Dieter Zetsche says he's surprised that 24,622 Smart ForTwo cars were sold in their first year of U.S. sales. Daimler produces the cars, and in the United States Penske Automotive Group is the sole distributor, responsible for sales and marketing of the brand. Penske, who is chairman of Penske Automotive Group Inc. — the country's second-biggest public dealership group — appears a little amazed at the sales numbers. That's evidenced by the big smile on the face of the silver-haired, impeccably dressed racing mogul and entrepreneur billionaire. "We were contemplating 15,000 to 16,000 in our first year, and as we entered into probably the most unique marketing of any brand coming into the market — Smart with a $99 reservation system — the Internet became the medium for us to build to a brand," Penske said in an interview last week at the Detroit auto show. Smart did no traditional TV or print advertising. Instead, it relied on the Internet and a 50-city road show where more than 50,000 customers took test drives. Will sales hold up in Smart's second year? Penske says 40,000 people who have put in a $99 reservation through the brand's Internet ordering system are clamoring for a Smart. Sales are on a first-come, first-served basis. Based on 2008 data, Penske says he expects 55 percent of the reservation holders to take delivery of a car. An additional 8 percent of sales is expected to come from so-called orphans — vehicles that customers ordered and then didn't buy. Based on the number of reservations and fourth-quarter demand, Penske thinks Smart could sell 25,000 cars this year. The Smart reservation and order system has enabled Penske to "stay connected to the customer because dealers don't have that direct contact." For 2009, the company has set up Smart Express. In markets with heavy reservations and a long waiting period, Smart finds orphans from other markets and pairs them with reservation holders. Smart used the Internet and a 50-city road show to market the ForTwo. Smart has 74 dealers and likely will expand to about 80 this year, says Penske. Each dealer spent about $600,000 on the store. "The value proposition for the dealer has been very realistic. There is no cost pressure, so their ability to invest is possible," Penske says. About 18 percent of the cars ordered become orphans. Dealers can sell those cars out of their showrooms but cannot charge over list price. Penske says Smart is staying with the Internet reservation and ordering system because of the added benefit of staying in touch with customers and potential buyers through surveys and follow-up services. Service and information calls from Smart customers come in by telephone to Penske Truck Leasing. "We open a repair order when you call," says Penske, "I know how many cars are down every morning or the issues, and we can get the dealer involved. I look at the service calls every day." For 2009, Smart imported the sporty Brabus model — which is tuned by Brabus GmbH in Germany. This year's allocation of 1,500 units was gobbled up in eight hours. 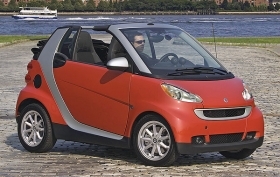 Smart got an additional 500-unit allocation from Germany, and those sold out in eight hours, Penske says. He says future models include an electric car and enhancements to the current ForTwo. And how does the man who can own any car he wants feel about driving a Smart? Penske owns two and says: "I have never driven a vehicle when I get more thumbs up."